Dummy movement was well controlled. The side curtain airbags on both sides of the vehicle deployed during the crash. After the dummy moved forward into the frontal airbag, its head contacted the driver side curtain airbag. The dummy's head was protected from being hit by any hard structures, including the intruding barrier, by a side curtain airbag that deployed from the roof. 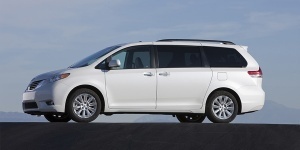 Find the used Toyota Sienna of your choice from a dealer in your area. Search our used car listings now.